Mohammed Ajmal Kasab, 25, the lone terrorist to be caught alive during the 26/11 Mumbai terror attacks four years ago, was hanged to death at 7.30 am amidst tight secrecy. A short while after prison doctors declared him dead, Kasab was buried in the prison premises as neither his family members nor the Pakistani government came forward to claim his body, Maharashtra Chief Minister Prithiviraj Chavan said here. execution was conveyed to him, sources said. “He did not express any last wish. He did not say anything,” Home Minister R R Patil said after the execution. However police sources said Kasab wanted his mother to be informed about the date of his execution. Necessary arrangements were made to do so. He also refused to draw up a will, officials said. As per Operation X, as it was called and which began on Monday, Kasab was shifted from the high security Arthur Road Jail here where he has been lodged for the past four years to the Yerwada Jail in Pune. It is one of two jails in the state which has the facility to carry out death sentences. A medical examination was conducted on Kasab and doctors at the jail certified him fit and free of any ailments. He was then shifted to a special room reserved for those on the death row. Days before the execution, the rope to hang Kasab was prepared by the hangman brought from Nagpur, officials said. The identity of the hangman is being kept a secret for security reasons. The hangman was paid Rs 5,000 for the job. The government opted for a professional hangman though many citizens had volunteered to carry out the execution for free. Early this morning, Kasab was woken up and asked to get ready. After bath and prayers, Kasab was given new clothes to wear. He was then taken to the prison hospital where the doctor checked him and declared him fit. Kasab was then taken to the chamber leading to the gallows where he was asked if he had any last wish. He didn't have any. A hood was then placed over Kasab's face and he was then taken to the gallows. The noose was placed around his neck and the lever was pulled at 7.30 am. Doctors declared Kasab dead at 7.40 am and the execution being completed was conveyed to senior functionaries like CM Prithviraj Chavan and Home Minister R R Patil. According to sources, only a handful of officials in Delhi and Maharashtra were aware of Kasab's execution plan. At the Yerwada Jail, the execution was overseen by senior police officers, including IG Prisons (Maharashtra) Meera Borwankar and Jail Superintendent Yogesh Desai. A few hours after his execution Kasab was buried in the Yerwada Jail premises as no one came to claim his body. 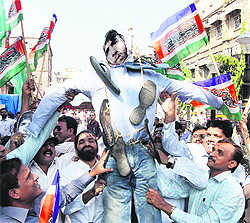 About an hour after Kasab was hanged, Patil officially announced the execution. “After following all legal process, Kasab was hanged this morning. 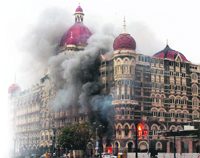 This is a tribute to all those innocent people and officers who lost their lives in the Mumbai attacks,” Patil said. Meanwhile, the relatives of those who lost their lives in the 26/11 terror attacks have welcomed Kasab’s execution. Divya Salaskar, daughter of Sub-Inspector and encounter specialist Vijay Salaskar who lost his life in the attacks, said she was happy that the execution was carried out. "For four years I was waiting for Kasab to be hanged," she told reporters. Divya added that the family came to know of Kasab's execution from television channels. They later got confirmation from the police department. Eknath Omble, brother of police constable Tukaram Omble who grappled with Kasab despite being fatally shot but helped the terrorist to be nabbed, said the execution took a long time in coming. “Four years is a long time. People like Kasab and Afzal Guru should be executed without much delay,” Omble said. ‘Tell my Ammi’, this was the message conveyed by LeT terrorist Ajmal Kasab, who was hanged on Wednesday for his involvement in Mumbai terror attack, when he was told about his November 21 execution, official sources said. ‘India and Pakistan squabbled over communication about the hanging of Kasab.After the hanging was carried out, Home Minister Sushil Kumar Shinde said:"The External Affairs Ministry through our mission in Islamabad had informed Pakistan about Kasab's hanging. When they did not accept the letter, they were communicated through fax." Pakistan, however, said it had "received the note and acknowledged its receipt."